It never really occurred to me to even think about everything that went into making that awesome tasting steak until those first few days at the NCBA convention. Twenty years later, I am well versed on the complicated process of beef production that begins on a cow-calf ranch and ends at the grocery store. I know that it takes teamwork, a dedication to caring, and a disciplined and respectful use of natural resources. Fifteen years ago, I took over the job of procuring cattle for the feed yard. I set out looking for ranchers who wanted to partner with me — sharing information that allowed for the improvement of both animal welfare and beef quality at the first two levels of beef production: the ranch and the feed yard. I was finding success personally as a calf caregiver, and I realized how much better the lives of my cattle would be if I could better organize a holistic lifetime care program that included ranchers who shared my vision. The make up of resources on our farm did not allow for a cow-calf herd, so I set out to find ranchers who wanted to collaborate with me and follow their calves from birth to harvest. The majority of cattle in the United States spend the first 8-14 months grazing on grass pastures and growing from about 70 pounds (at birth) to approximately 600-700#. Grass is a wonderful resource and a critical component to raising beef. More than half of Nebraska’s landmass (23 million acres) is made up of these grasslands where the soil and topography allows only for the growth of prairie grasses. Cattle, as ruminant animals, have a digestive tract that is made up of four compartments which allows for them to be tremendously efficient grass converters. This capability provides a core component in our effort as farmers to convert a non-edible resource (grass) into a nutrient packed and great tasting human protein source (beef). The list of ranchers that I work with has grown over the years, and my partnership with them allows for better animal care and a smaller environmental footprint in our journey of beef production. Our animals remain healthier both allowing for a more efficient conversion of feed resources, and a smaller antibiotic use footprint. Tracing the performance of the animals from birth all of the way into the packing plant allows for genetic changes to improve beef quality, taste, and tenderness. In short, together we get smarter as farmers, and our animals get more efficient and produce a higher quality beef product. The Evert family is one of my cow-calf ranching partners. I met Virginia Evert when she went to work at Eastside Animal Center as a vet tech in 2002. Four years ago, she left the vet clinic to work full time ranching with her cousin and raising their families. I do not often get to work with women, and I consider it one of my greatest pleasures to work with Virginia and Rachel and their families. It is easy to work with people who share your values. It is easy to partner with those who teach their animals confidence and curiosity. It refills my cup to watch the improvement that Virginia, Rachel and I can make each year in our journey helping that great tasting steak get from the grass pasture to the meat case. Great job on your advocacy of Nebraska farming and ranching. Truth about people’s food rather than the scare tactics of some is refreshing. The science and knowledge of the farmer/rancher is far superior to those that are not in touch with agriculture every day. I takes smart, efficient producers to feed this ever growing world. Thank you, Mike. As a farmer I try to do the right thing everyday for my animals — while I know that is the most important of my many jobs, sharing that story of care is also important if I want to still be a farmer in the future. I have met some pretty amazing people in my journey in the beef industry. It would be wonderful to share all of those “good stories” of truth so that the American public at large would feel good about “where their food comes from”. Scare tactics are not sustainable and they threaten our food supply as well as the livelihood of the farmers that grow it. I appreciate the comment and support. I was just finishing up my blog post about the Illinois Farm Families spring ‘City Mom’ tour to the Adams’ family farm in Sandwich, IL when your post appeared. 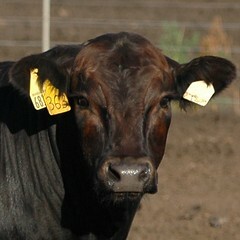 So much of what was shared at the northern Illinois cow/calf farm was echoed in your writing. Love reading your blog! I loved your blog post, Angie! Thank you for sharing the link. It sounds like you had a wonderful time and were able to learn many different things. As you sensed from Alan and his family, many farmers are excited to share their story of food production — transparency is important to us — we just need to find a good method of connecting with those folks (like you) that are interested in learning how food is raised. I’m delighted that you took the time to read my post. 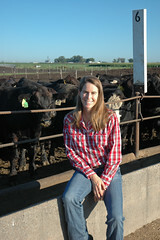 I’ll be following and reading your blog to continue to add to my understanding of what, how, where our food comes from. 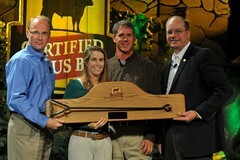 Thanks for all you do to raise healthy beef and to educate others about food. Enjoy those wide horizons! Someone put trees in the way of the sky where I live. Can’t see a thing!